Music! Dance! Theatre! Visual Arts! Registration for STARS Winter/Spring 2006 classes is now open. Register in person weekdays 10-5. A class schedule is available online. Join Us for the Downtown Holiday Open House! The Soo Theatre Project Board of Directors invites you to stop by the Soo Theatre Arts Resource Studios (STARS) on Saturday and Sunday, November 19 and 20, noon to 5 p.m. as part of the Downtown Holiday Open House. Get a look at the new studios. Take part in singing songs of the season. Have a goodie or two! STARS Is Up and Running! Registration for STARS Fall 2005 is now open. Register in person weekdays 10-5. A class schedule is available online. SAULT STE MARIE - Soo Theatre Arts Resource Studios (STARS) will open its doors on September 12. Information and registration for classes at STARS will be available in the lobby of the Soo Theatre starting on Thursday, September 1. Dance classes will be offered in ballet, lyrical, pointe, jazz, and tap. There will be classes for everyone from beginners at age 3 to adults who always wanted to learn to dance. Beginning to advanced theatre classes will also be offered. Introduction to oils and landscapes will be included in the curriculum. Most dance, theatre, and art classes will be limited to 10 students. STARS music studios will offer private instruction and small classes in cello, violin, viola, piano, trumpet, saxophone, clarinet, voice, harp, and flute. All classes at STARS will be taught by professional teachers with degrees or years of experience in their fields. PORTLAND (AP)—Riverside boardwalks. Renovated storefronts. Loft apartments. Those are among the improvements paid for by state grants last year under Gov. Jennifer Granholm's plan to make urban areas across Michigan more appealing to young professionals. Nineteen projects across the state received grants worth $100,000 in the first year of the "Cool Cities" program. A few cities now have newly renovated buildings. But others still are getting permits or continuing to raise money to supplement the state grants. Residents in some of the 16 cities that won a grant last year are enjoying new amenities, including parks, river walks and art centers, and their new "Cool City" status. Some officials in cities that received grants in the first year of the program say the awards gave them easy access to state officials who handle permits for urban renewal projects and opened doors to other funding and donated services. In Sault Ste. Marie, the campaign to restore a 1930s-era theater and improve neighboring storefronts has received about $100,000 in donated services, including most of the work needed to tear down a wall that split the theater stage. "Our architect estimated the project will cost $3 million, but I think we can do it for less because there already have been so many in-kind contributions," says Colleen Arbic, one of the project organizers. She expects the restoration to take three to five years. SAULT STE. 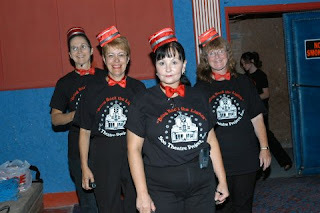 MARIE—Anticipation was in the air Friday night, August 5, and Sunday afternoon, August 7, as approximately 500 people each day filed through the doors of the historic Soo Theatre. For the first time in years, lines snaked down the block on Ashmun Street as people waited for the doors to open. On stage, the show opened with the Board of Directors of Soo Theatre Project, Inc. singing " I Fell in Love In Sault Ste. Marie," followed by the Footlight Dancers in a number choreographed to the song "The Curtain Can Go Up Because the Wall Came Down." Lise White and the Ain't Misbehavin' Ensemble accompanied the Board and sang the "curtain" song, also entertaining the audience later with a mini-concert after the play. The crowd was exuberant as the Lock Cities Chorus of Sweet Adelines and Singers United performed "Songs Through History." Singers United featured one number directed by Mary Wood, whose chorus grace the stage of the Soo Theatre many times in the past. Time Capsule: Sault Ste. Marie, a play written by Steve Welch to commemorate the 150th Anniversary of the Soo Locks, was performed by a cast from Sault Community Theater and directed by Michelle Breen. A step into the past celebrations of the Soo Locks, it was both entertaining and informative. On August 7, Time Capsule: Sault Ste. Marie was presented again, much to the delight of the audience. The cast included Frank Breen portraying Peter White, JT Byrd as Dr. Innafix, Colleen Lavey as Mrs.. Innafix, Ed Woodall as Jonathan Smith, Brooke Wagner as Miss Barbara Hank, Oliver Beaudoin and Michelle Willis as Ojibwe Warrior and Princess, and Jason Markstrom portraying a Jesuit Priest. Taylor Brugman was the technician for all performances. A Musical Variety Show was also presented by Soo Theatre Project that day. The Board of Directors and Footlight Dancers (Elise Beaudoin, Allison Dale, Kelly Kaunisto, and Kara Pingatore) repeated their Friday night appearances. Following that was a stellar line up of local talent including Karen Hughes, Richard Morrison, and Enoch Jacobus performing numbers from the Cedarville production of My Fair Lady. Theresa Zednicek and James Warner Smith sang a Gilbert and Sullivan song; St. Mary's Schola Cantorum presented their version of Gregorian jazz; Susan Askwith and Dave Stanaway sang original historic songs; George Snyder entertained with two humorous original songs; and Bahweting Middle School Students performed a number from their production of Shake, Ripple and Roll and presented the Soo Theatre Project with a check for the proceeds from that production. Singers United sang songs from Oliver and gave a rousing finale to the program with "It's a Grand Old Flag," with the Footlight Dancers adding the final touch. The excitement of the audience was palpable for all the performances in the old theatre. This was a nostalgic trip into the past for many in the audience and on stage, when live performances were a regular feature. Others are anticipating the chance to come to future performances, both live and on film. 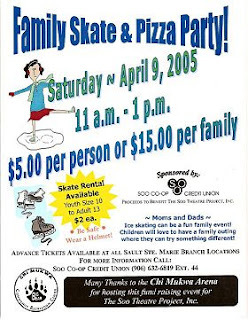 Many parents and grandparents dream of seeing their children performing on stage, or bringing children to events planned especially for families. A Really Big Shew, Live, in the Soo Theatre! Sunday, August 7th at 1:00 p.m. Featuring: "Songs Through History" and "The Soo Theatre Variety Show," with special performances by the Soo Theatre Project, Inc. Board of Directors, The Ain’t Misbehavin’ Ensemble, and The Footlight Dancers. And Look! There's More! An original play for the Soo Locks Sesquicentennial Celebration!! 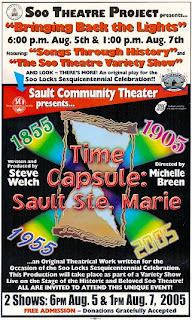 Sault Community Theater presents... Time Capsule: Sault Ste. Marie, written and produced by Steve Welch and directed by Michelle Breen. Time Capsule: Sault Ste. Marie follows eccentric inventor Dr. Innafix as he explores the history of Sault Ste. Marie. After creating a time machine, Dr. Innafix visits 1855, 1905, and 1955 Sault Sainte Marie and inadvertently brings the people he meets in the past to present day. Written especially for the occasion of the Soo Locks Sesquicentennial Celebration, this production will take place as part of a Variety Show live on the stage of the Historic and Beloved Soo Theatre. ALL ARE INVITED TO ATTEND THIS UNIQUE EVENT! Two shows, live on stage: 6 p.m. August 5 and 1 p.m. August 7, 2005. FREE ADMISSION! Donations gratefully accepted. Don't miss this opportunity to see the stage of the historic Soo Theatre in use as it hasn't been seen in decades! Our Summer 2005 Newsletter is now available online. A PDF version is also available. Check out a few photos from the Fourth of July. WSOO set up their broadcast of the parade under our marquee. The rain held off and a good time was had by all! Enjoy a Fifties Musical for Our Benefit: Shake, Ripple, and Roll! Enjoy a kid-generated, kid-produced (with the help of some teachers!) fund-raiser for the Soo Theatre Project! On Tuesday, May 24 at 6:30 p.m. at the Kewadin DreamMakers Theater, the JKL Bahweting Middle School Students will present Shake, Ripple, and Roll, a 1950's musical. Tickets will be available at the door: $5 for adults, $3 for students. Kids 5 and under will be admitted free. Proceeds go to the Soo Theatre Project. This is sure to be a fun show for the whole family. Hope to see you there! The Soo Theatre, completed in 1930, was divided into two movie theatres in 1974 by a sturdy, fireproof concrete block wall. The restoration of the theatre to its former glory had to start with the removal of that wall. Thus "The Curtain Can't Go Up Until the Wall Comes Down" campaign was born, complete with a song composed by Soo Theatre Project board member John Ignatowski. Follow the story of how The Wall came down this spring. As shown in words, pictures, and even one video, this thrilling chapter in the Theatre's history was made possible through the truly monumental efforts of many local people. Conversion of the Soo Theatre Project storefronts into music and dance studios and a café is underway. New pictures of the demolition and construction are now available online. SAULT STE. MARIE - The Board of Directors of Edison Sault Electric Company (ESEC) have responded favorably to a request from the Soo Theatre Project group for a monetary contribution towards the Theatre redevelopment by allocating a grant of $35,000, according to a ESEC release. "It is a pleasure for me to make this announcement as our board feels strongly that these types of citizen initiatives need the support of the local business community," said Donald Sawruk, president of Edison Sault. "The Edison Sault Board was also pleased to see that city residents felt strongly enough about downtown development to pass a recent ballot proposal supporting the construction of a new parking facility. The parent company of Edison Sault Electric, WE Energies, is committed to recognizing citizen initiatives within the service area of Edison Sault. Over the past several years, Edison Sault and WE Energies has also contributed to other various public facilities construction in St. Ignace, Hessel and on Mackinac Island." Sawruk also noted that these types of contributions come from the shareholder profits of Edison Sault and WE Energies and act as a reduction to net income. "This generous contribution from Edison Sault Electric has given us a bright start to the new year," said Soo Theatre Project President Dianna George. "The project is taking on a life of its own and the growing community support is most encouraging." "This donation gives us a major piece of the matching funds required for the Cool Cities Grant and also provides seed money for future grants," added Project Vice President Colleen Arbic.